Birding Is Fun! : Always be Birding! In the world of stand-up comedy and in the world of sales, the refrain often cited to keep one at peak performance throughout his/her routine/presentation is "Always be closing." Well, much to my family's dismay, a twisted version of that is my mantra too..."Always be birding!" After dropping Kyle off to Cub Scouts we had to run to Hobby Lobby for Jessica to pick up some fabric for something she's making. I refuse to go into that place* (see why below). So while mommy went into the store, I took the girls on a little drive around the parking lot to look for birds. (Yes, ever since I came across an infrequent Great-tailed Grackle in an Idaho Walmart parking lot a couple years ago, I do indeed look for birds in parking lots.) Just to the north of Hobby Lobby is a weedy vacant lot with old barbed-wire fence posts. Perfect habitat for a few varieties of birds. I could see bird-like lumps on the top of a few posts, so I put my Eagle Optics Ranger SRT 8x42's on them. 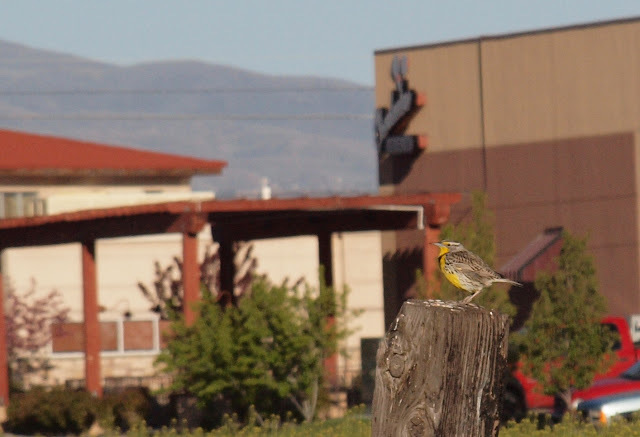 A pair of Western Meadowlarks and a good lookin' Western Kingbird! A cool lump on a post in an urban area along Idaho's busiest road. Boise's still snow-capped mountains in the background. I got the girls out of their car-seats and we began the adventure of trying to get as close as possible for a photo without making them flush. The weeds were higher than our youngest Claire is tall, yet the girls were troopers. While my girls did not move in the stealthy silence like special forces units that I wanted them to be, we still got close enough for my 150mm lens to get off a few shots. We saw the Western Kingbird fly a couple sorties in true fly-catching form. Here it is with its head cocked looking up at what must be its next appetizer. A Western Meadowlark on the adjacent post. I guess it was a few minutes of birds with the name "western" and some amount of yellow. So, the moral of my story here is: No matter how dire your circumstances, it is very likely that wonderful birds are nearby, so go find and enjoy them! *Now guys, don't be fooled. Hobby Lobby is nothing like Hobby Town. When I saw Hobby Lobby being built on Eagle Rd. I was excited thinking about all the really cool stuff they might have in the way of hobbies for men and boys. With eager anticipation, and much to the surprise of my wife, I made sure we planned our first visit to Hobby Lobby. As I crossed the threshold of Hobby Lobby I was immediately assaulted with fake plants and flowers, row after row of bolts of fabric, that certain smell that all craft stores have, and not a single section of all-things-cool for dudes. For Jessica, this was like walking into heaven. I had previously been suckered into agreeing to walk down each isle by my wife who knew exactly the kind of store this was. Once I realized the kind of man-hell I was in, but still being a man of my word, I cruised each isle at such a pace that each item was seen only as a blur. I had been deceived in my expectations, so I ain't goin' in that place again. Heh-heh-heh. We have also seen Great-tailed Grackles in the WalMart in Idaho Falls! We were so confused at first, but now, each time we go, we always listen and look for them! I'm glad to know that I'm not the only one who birds while I wait. Today I'm in town with my husband for our date tonight, and in the meantime I am birding! We carry our binoculars everywhere! PS- I love your blog! Good idea to check the parking lot. Isn't that where the birds go to hang out while we wander around field and woods looking for them? I bird the Walmart parking lots also as well as Dunkin Donuts, McDonald's, the library, ect. My local Fry's Grocery store is always good for Brewer's Blackbirds, and a red-tailed hawk or 2 along with the ususal house sparrows, great-tailed grackles, and MODO's! Sometimes I even find verdin, cactus wrens, gila woodpeckers, and a warbler or 2! I'm with you Robert. I always have my bins and I'm always birding, wherever I am. There are birds everywhere, most people just don't usually notice them. I've had people come up to me in the middle of the Costco parking lot as I was sneeking up on some Brewer's Blackbirds, wondering what I was taking photos of. It's a great way to turn others on to birding too! 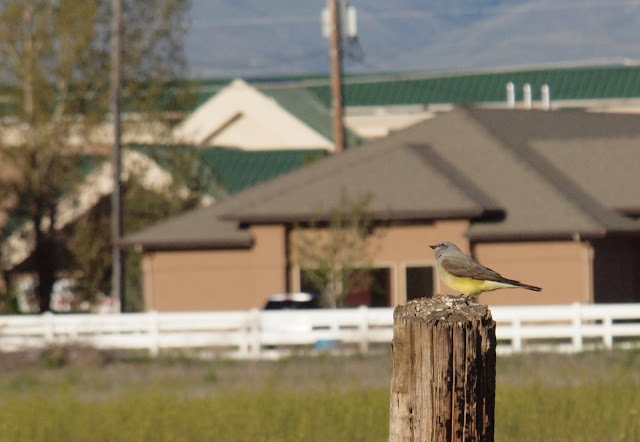 Nice shots of the Western Kingbird and Meadowlark too.